Country's worst earthquake in 80 years leaves tens of thousands homeless; deaths also reported in India and Tibet. Close to 1,500 people have been killed and scores more injured in a massive 7.8 magnitude earthquake in Nepal - the country's worst in eight decades. 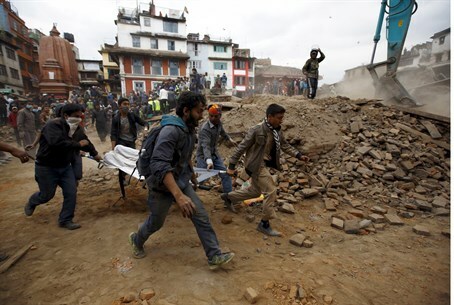 The Nepalese government has declared a state of emergency, after the quake struck the center of the country, in between the capital Kathmandu and the city of Pokhara. Emergency aid has already been offered by several countries, including neighboring India - where casualties were also reported - as well as Pakistan and the UK. The US government has already sent one million dollars in aid, and will be dispatching a disaster relief team. Current reports are placing the number of deaths in Nepal at around 1,200, and expected to rise. Other countries effected by the quake are India, where at least 35 have died; Tibet, where five people are dead; Bangladesh, where one fatality has been reported so far; and on Mount Everest, where the tremors triggered a deadly avalanche which killed at least eight people. It is Nepal's worst earthquake since 1934, when approximately 8,500 people were killed in a major earthquake. In addition to the deaths scores have been reportedly injured and tens of thousands left homeless. Among the buildings destroyed are several historic monuments, including some listed Unesco world heritage cites.